Diving off a dock into the lake. Roasting marshmallows over a campfire. Pooping in an outhouse. In retrospect, camp was a pretty good time. Being an adult? Not quite as good. It's probably not the ruleless paradise you dreamed of as a kid. Going back to childhood, even for just a couple days, can sound terribly appealing. That's especially true if you can add beer to your camp experience and maybe subtract the awkward pubescent sexual tension. 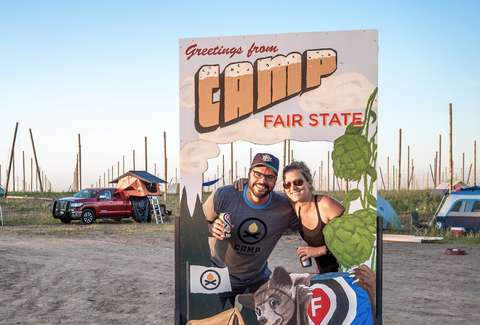 Beer is undeniably integral to Camp Fair State, a camp for adults hosted by Fair State Brewing Co-op, one of Minnesota's best breweries. The retreat takes place September 7-9 in northern Minnesota, and it's a no-kids wonderland for beer-loving adults. Fair State's big kid getaway is in its second year. The first year was a bit of a test run. "It started because, a couple years ago, we were going to All Pints North, the beer fest in Duluth," says Davin Haukebo-Bol, member coordinator at Fair State and, for a portion of the year, camp director of Camp Fair State. "Our president, Evan [Sallee], suggested we rent a big campground and have a campout with our members." 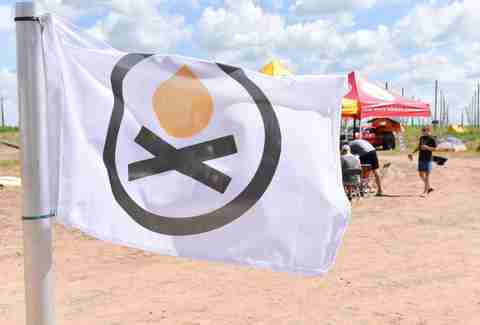 Transportation concerns waylaid that plan, but it was the seed of what became the first year of Camp Fair State in 2017. There were 50 campers at the Mighty Axe Hop Farm in the first year. It was a little barebone compared to this year's plans, even if everyone had a damn good time. The camp is moving from a farm to an actual camp. Up to 150 campers will be in cabins at YMCA Camp Miller in Sturgeon Lake, Minnesota. It's the sixth-oldest camp in the country. "We're scaling up across the board," Haukebo-Bol says. "Rahr Malting is coming and overseeing a lot of the beer-themed stuff. There's a homebrew session where folks can come in, know nothing about homebrewing and leave ready to get started on their first batch. For more advanced folks, Rahr is sending one of their people to talk about different mashing techniques." There will also be an expert on-hand talking about the aromas and taste of various malts. Meals, lodging in a cabin, a camp shirt and mug, tons of activities, and, of course, all the beer you'd care for are included in the price of admission, which isn't cheap at $450. However, you're getting quite a bit at camp, even if learning how to brew isn't your cup of kombucha. You can get way into camp-mode and go hiking, swim in the lake, mountain bike, hit the climbing wall, do crafts, canoe, practice your archery skills, or join in a massive game of capture the flag. There will also be coffee tastings with Duluth Coffee Co., yoga sessions, and an "adulting track" of classes that includes a talk on first-time home buying with Bell Bank. Maybe you'll even get lucky and have your underwear run up a flagpole and get a counselor named Ug. You can dream.